Ranch House was designed by Galeazzo Design, and it’s located in São Paulo, Brazil. 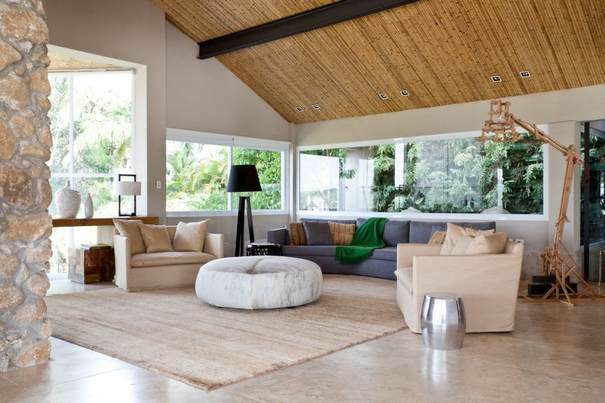 The spacious home makes use of many different materials – bamboo and other types of wood, stone, etc. – to create a welcoming environment. “Located in the countryside, near to the city of São Paulo, this ranch house of 1900m² (20450 sq ft) was designed to be a place of leisure and meeting to several generations of a big family. For cladding were chosen natural and sustainable materials such as demolition wood to the floor and cabinetry parts, bamboo for the roof overlay and pergolas, rough stone for the fireplace and some walls and soil and calcareous paint. In the main hall an old log was brushed and used as axis for a helical staircase made of corten steel. 1- Spa: game room, massage room, steam room, dry sauna, turkish bath, leisure room, gym, heated pool with current and spa for 30 people, both with retractable roof. 2- Internal Social Area: Big living with 4 spaces, dining room, lunch room, social hall, pub, cellar and movie theatre. 3- External Social Area: Big pool with spa, hamick area and a restaurant up to 100 people with infrastructure for bar area, barbecue and pizza, and a little stage for performances. 4- Intimate Area: With 7 suites and annex for guests.